Today of all days that are Friday I am taking my handsome son camping! Well, not really. You see my grandparents, aunt and uncle are also going. 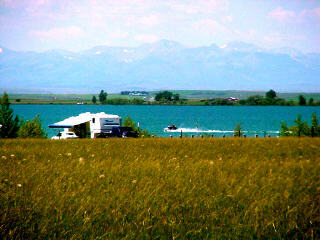 To the lovely Lake Frances just outside of Valier. I will be sleeping in a motor home (okay it's not a tent but I still consider that camping! ), I will be eating s'mores, I will be snuggling a cute little boy and, oh yes, I will be fishing. I have a fishing license and everything. Maybe this time I will work up the courage to put a worm on my hook. Or maybe this time I will actually touch a fish. Who knows. So many possibilities. Sadly, Jefferson will not be going with us. His Grandpa passed away last night and he's not really feeling very social. I don't blame him. Keep my guy in your thoughts. He needs them!